The search for the perfect bean is over for all of us at Nuttee Bean Co.™ We have produced a fabulous nutritious snack that can improve your diet by increasing fiber, protein and carbohydrates. In one glorious snacking experience, Roasted Fava Beans will add nutrients to your Recommended Daily (Dietary) Allowance. Nuttee Bean™ has created an irresistible nut-free, allergen free vegetarian sensation that will leave you begging for more. Unlike unhealthy, high fat and high sugar snacks, roasted fava beans are nutritious by providing 30% of the RDA’s for women’s fiber and 25% for men. This is a high protein snack that Vegetarians will be happy to add to their diet. 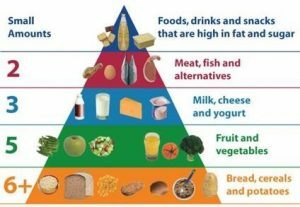 Below is The Revised American Food Pyramid. The green vegetables section recommends five servings each day from fruits and vegetables to increase fiber and nutrients. Nuttee Bean™ Snacks can help you fulfill your daily vegetable requirement, add protein, fiber and carbohydrates while you snack away! Nuttee Bean™ Snacks can help you fulfill your daily vegetable requirement, add protein, fiber and carbohydrates while you snack away! The Nuttee Bean Co. provides quality, healthy, non-allergenic, flavorful and affordable snack products that can be enjoyed by everyone. The Nuttee Bean Co.™’s first product line of Roasted Fava Beans is a high protein, gluten-free and nut-free snack that is crunchy like a nut. Nuttee Bean™ Roasted Fava Beans will be available in hundreds of convenience stores in Dade, Broward and Palm Beach Counties and online at www.NutteeBeans.com and www.beansRcool.com.